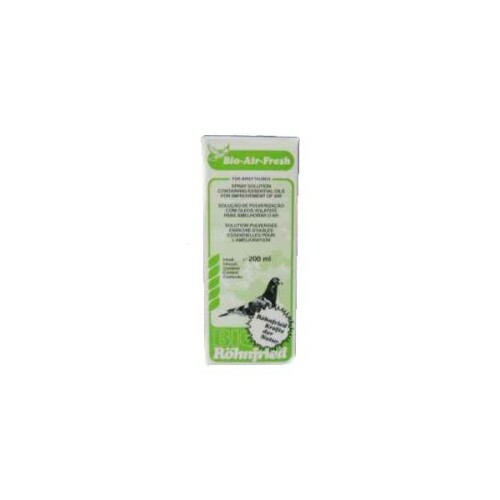 Bio-Air-Fresh is a spray solution containing a concentration of essential oils distillates from a combination of herbs for the improvement and disinfection of the air. 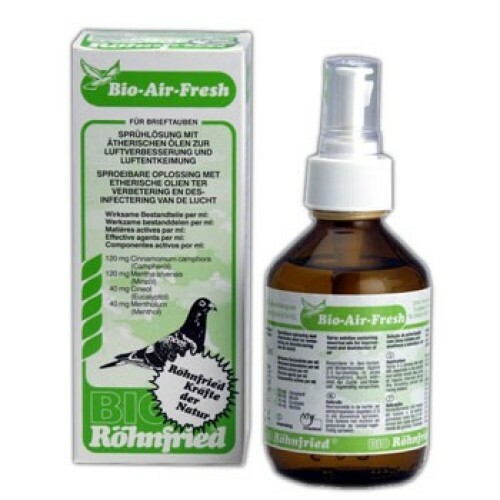 • Bio-Air-Fresh is a spray solution containing a concentration of essential oils distillates from a combination of herbs for the improvement and disinfection of the air. • These ethereal oils have assisted in the maintenance of healthy respiratory organs for generations. • Spray 2 - 3 strokes in each loft section every day to help improve the pigeons resistance to colds and respiratory problems and at the same time leave the loft smelling ‘Bio-Air-Fresh’. • Bio-Air-Fresh is available in a 200 ml atomiser spray.